1. All matches will be self-officiated. The tournament director will moderate all disputes. 2. Competitors will play two matches selected at random within their age category, division and gender; a match is the best two out of three games with scores to 11. 3. Top individuals advance to a single-elimination tournament. 4. The single elimination tournament will be best three out of five games up to 11. Medals will be awarded to first, second, and third by gender and age group. 1. Players must provide their own paddles. 2. Paddles must be different colored sides. 3. No sandpaper paddles are permitted. 4. I.T.T.F. approved balls will be provided. The United States Table Tennis Association rules apply (www.teamusa.org/USA-Table-Tennis). With some modifications. 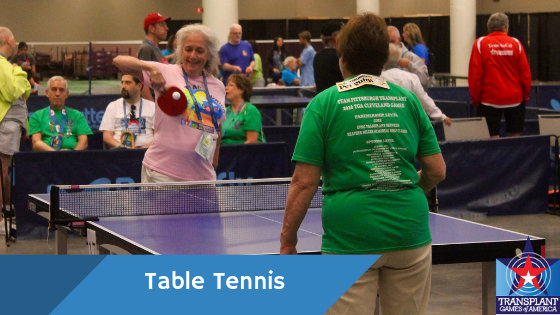 Once an event is completed and results are available, table tennis staff must record all competitors and scores to the appropriate system/documents. When electronic scoring is being utilized a manual backup system must be in place to record results.